Blood Pressure Chart - What Is Normal? Scroll down for a free printable Blood Pressure Chart. SYSTOLIC blood pressure is blood pressure reading as the heart muscle contracts. DIASTOLIC blood pressure is measured when the heart is relaxed. The blood pressure table shown here is the simplest way of visually representing high, low, and normal blood pressure ranges. However, normal ranges will vary somewhat. In many cases, blood pressure that is too high or too low can be corrected with an improved diet, moderate exercise, and other lifestyle changes such as quitting smoking. More severe blood pressure problems require medication prescribed by a physician. Reliable blood pressure readings are taken at different times of the day. Doctors use this collected data to get an average blood pressure reading for the patient. Blood pressure is measured in millimeters of mercury. Most important is your Mean Arterial Pressure (MAP), which is the calculated average of many measurements over time. Normal Mean Arterial Pressure is roughly 93 millimeters of mercury. Someone with a MAP higher than 135 runs an unusually high risk of heart attack and stroke. In most cases, medication is immediately required. In fact, medication is often advised for those with a MAP of more than 115. Children and athletes typically have MAPs of between 70 and 80. Any mean arterial pressure below seventy is considered too low, and medication may be required to prevent fainting. Recommended nutrition for lowering blood pressure includes a very low salt, low protein, caffeine-free diet. Highly recommended foods that promote healthy blood pressure include Apples, Avocado, Bananas, Broccoli, Fish, Flax seed, Garlic, Grapes, Oats and Orange Juice. To print this blood pressure chart, simply right click on the image and save it to your picture file. From there you can reduce or enlarge it as needed. 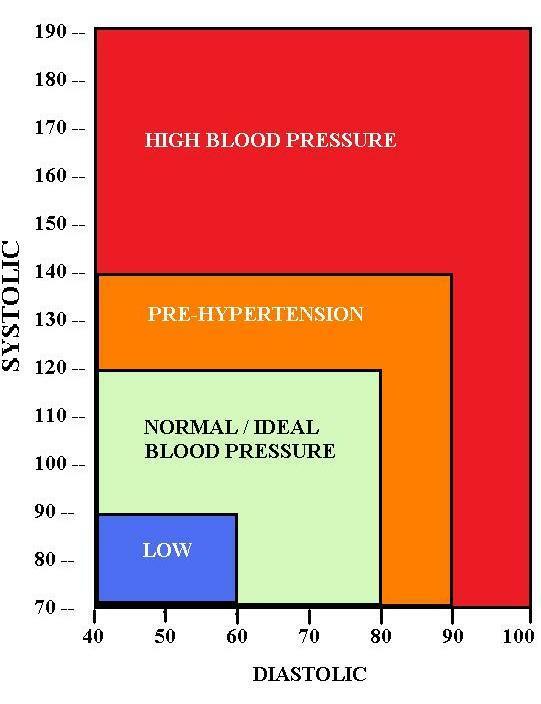 If your MAP blood pressure registers far outside the normal range shown on this chart, see a doctor for further advice. List of healthy Low Carb Foods. Free printable Healthy Weight Chart.